A few years ago I was playing a rare round of golf. Because I’m no Tiger Woods (in more ways than one, I guess), I was able to see much more of the golf course than most. 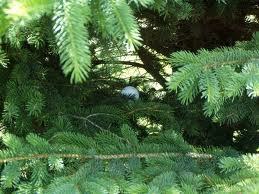 At one point, I found myself off the fairway and behind a few trees. About 15 yards ahead of me was an opening of about ten feet which provided a much more exciting (albeit perhaps not as wise) option than a safe sideways punchout to the fairway. Remembering a trick someone had taught me many years ago, I stood behind my ball and drew an imaginary line from the opening directly to my ball. Then I located a small stick which lay immediately on top of the imaginary line approximately two feet in front of my ball. I locked my eyes on the stick and moved into my address position beside the ball. From that moment on, I did not look up to see where my ball would lie. Instead, I focused all my energy on being certain I hit the ball directly over the stick. It worked. Because I was able to hit my ball over a target just two feet away, my shot continued on the right path for many yards. The ball soared out of the woods and came to rest in the fairway just short of the green (what happened after that is insignificant to this story). Here’s the lesson. Too often we paralyze ourselves with fear because of all the potential danger we see looming in the distance. Rather than focusing on what is right in front of us, we worry about the future, and end up making poor decisions. Psalms says God’s Word is a flashlight for our feet and a lantern for the path. The idea is that we can rely on God’s Word to illuminate the immediate circumstances in our lives, to help us make the right decisions right now. Even if we can’t see the future clearly, we can be certain that if we follow God’s Word today, it will guide us to where we need to be tomorrow. If you walk through the woods at night with your flashlight focused on the tree 50 yards away, you’ll probably trip over the root right in front of you. If you walk through life with your eyes focused on the danger which lies weeks ahead, you’ll probably trip over the the temptation right in front of you. Yesterday we talked in church about walking with God. It’s easy to walk by yourself. You can walk as fast or as slow as you want. When you walk with someone else, though, you have to pay attention to their speed. You have to match their stride. The reward for your effort is the opportunity to grow your relationship with the person walking beside you. A walk is an opportunity to talk, to connect, to get on the same page. God wants us to walk with Him. He wants us to take every step as if He is right beside us… because He is. Don’t worry about the steps you’ll take next week or next month or next year. Simply pay attention to your life’s next step. Don’t let your fear of tomorrow impede your focus on doing right today.